1 lb (about 400-500 grams) dried beans, or two large cans. 4 shallots, 2 sweet red peppers, I yam or sweet potato, ½ to 1 bulb fennel. 1-2 tablespoons olive, canola, or good quality oil, 4-6 teaspoons curry powder, at least 2 teaspoons cumin, ½ teaspoon ginger, ½ teaspoon cinnamon, a clove or two, hot red pepper, salt, and black pepper to taste. You may substitute an onion for the shallots, green pepper or celery for the fennel, and you may add 1-4 cloves garlic if you like it. The fish is optional, too; you can substitute ground meat or simply make a vegetarian version. If you are using dried beans, it’s a good idea to prepare them in advance. Pick them over, soak them overnight or at least 8 hours, and rinse them. Then put them in a large stock pot with water to cover by about an inch, a bay leaf, and a couple of peppercorns. Bring to a slow boil and simmer, stirring occasionally, for about an hour or until tender. Drain and rinse and set aside. If using salt fish, you will have to soak and parboil it, too. The instructions say to soak it for 24 hours with three changes of water, but, for this recipe, I’ve found it’s okay to soak it for about 12 hours with two changes of water. After this, rinse the fish and dice it. 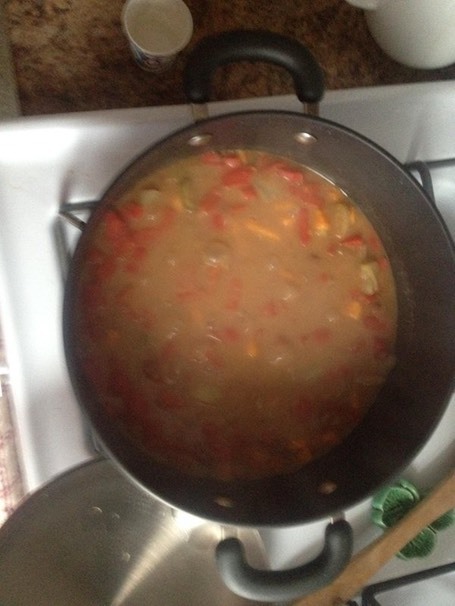 Put it in a small saucepan, simmer for five minutes or so, drain, and rinse well. While this is happening – or before – prepare your veggies. Clean and trim the fennel and slice it into fairly small pieces – about an inch or so. Peel the sweet potato and dice it. Peel and mince the shallots fairly fine. Heat up the oil in the stockpot and add the shallots, the spices, and then the diced veggies, Cook for about five minutes. Add the beans, four to six cups of water, and the parboiled fish to the pot. Bring to a boil, turn down the heat, and simmer for twenty to thirty minutes. Add the diced peppers to the stew about half way through the cooking time. Taste and adjust seasonings. This is quite a mild version and you may well find you need more curry and hot pepper. If you are using ground meat, you cook it with the shallots and/or onions and the garlic, if you’re using it. Then add the spices and proceed as above. If you’re doing a vegetarian version, just ignore all references to fish or meat and proceed as above. On Telanan, the Arimi usually add a few crumbles of goat cheese to each bowl of the veggie stew. Feta is a good substitute, and parmesan or cheddar will also work. For a vegan version, leave out the cheese and serve with brown rice or another whole grain.